The first ceremony was held on City Day, May 27. Now every Saturday at 11:55 the townspeople will be able to see an impressive parade ground with a demonstration of virtuoso techniques of possession of weapons. The first ceremony of the divorce of honor guard took place in the Peter and Paul Fortress this year. 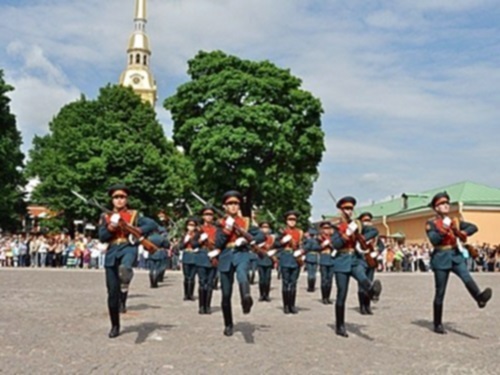 In summer, in the Peter and Paul Fortress, on the territory of Naryshkin Bastion, every Saturday after the traditional noon shot, the ceremony of divorce of honor guard takes place. Traditionally, the most spectacular elements of the ceremony are the parade- with a demonstration of receptions with a self-loading carbine and the removal of the flags of Russia and St. Petersburg. The details of the ceremonial were developed at the end of the 18th century, during the reign of Paul I, and its features were preserved until the beginning of the twentieth century: in those years the ceremony of changing the guard was held on the square in front of the Peter and Paul Cathedral. The guard service lasted until October 1926 - until the abolition of the commandant's office. At present, the ceremony is symbolic, and its details are developed by the Military Commandant's Office of St. Petersburg. The ceremony is attended by the personnel of the 165th separate rifle company of honor guard and the orchestra of the Headquarters of the Western Military District.